Posh centre-back Ryan Tafazolli (blue) competes for a header with Charlton's Darren Pratley. Photo: Joe Dent/theposh.com. Rhys Bennett and Ryan Tafazolli were superb in the heart of the Peterborough United defence at Charlton tonight (August 21). 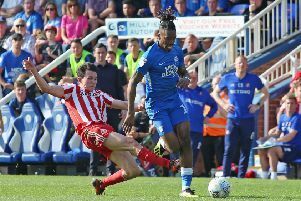 They were the star men in a very strong Posh team display, one which led to a 1-0 win, a fourth League One success on the spin and a position at the top of the table. Posh winger Siriki Dembele was clean through when he sawthis scoring opportunity saved. Photo: Joe Dent/theposh.com. Match ratings key: 10=Perfection, 9=outstanding, 8=very good, 7=good, 6=average, 5=poor, 4=stinker. Marcus Maddison: (for Ward, 61 mins). Ivan Toney: (for Godden, 61 mins). George Cooper: (for Dembele, 83 mins).